Our inspiration came from our desire to incorporate physical components into our project. This project stores a password on an Arduino, or similar device which is not connected to the internet. The password is flashed to the owner via a rgb LED. On the computer, a leap motion is used to precisely map the movement of the user’s hand. Using Processing, a GUI is developed which displays 8 colors. The user can select any color but must select the color given from the LED to get the password correct. We built this project using an Arduino uno and a Leap Motion sensor device. The Leap Motion and Arduino uno work independently of each other. 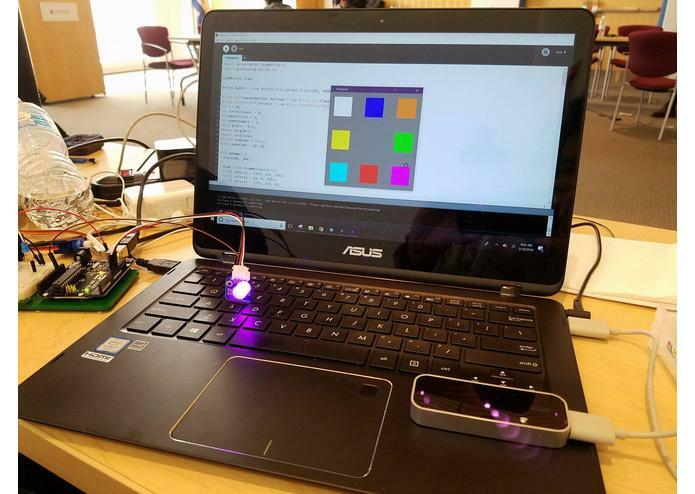 The Arduino uno controls the LED color output, which is essentially the password, while the Leap Motion maps the users movements. Processing checks whether the password is correctly input. None of us were familiar with the Processing IDE and we, as a team, had to learn how to use this language and IDE. We are proud that we were able to program this project. The hardware connections were very basic and easy for us, but the programming was the most difficult. We worked together as a team to learn as much as we could and implement something based on our recent knowledge.